To further celebrate the Year of Luigi, Nintendo of Europe has updated its Club Nintendo Stars Catalogue with this gorgeous commemorative gold-coloured coin. The item, which features the 'other brother', will set you back 1,500 of your hard earned Star Coins, and we couldn't think of a better item to spend them on. 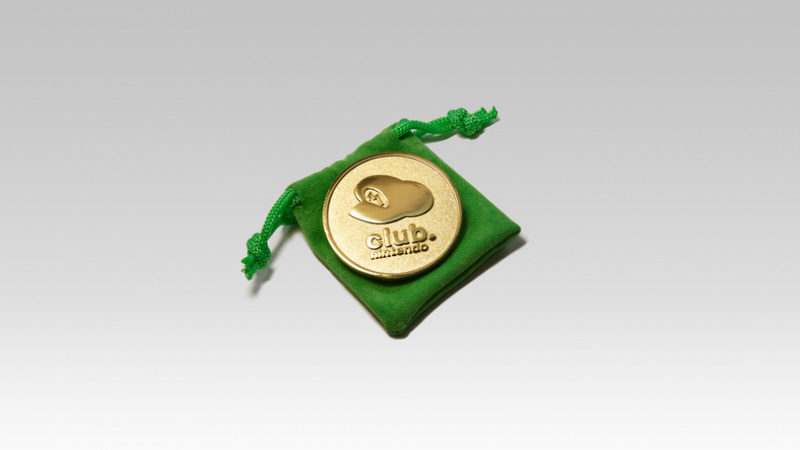 It comes included with a green velvet pouch featuring the Club Nintendo logo, to help keep the coin safe from pesky Goombas and Koopa Troopas. It's been a good year for the green clad character, as a Limited Edition Year of Luigi 3DS XL is making its way exclusively to Nintendo's official online store. We believe some are having some trouble accessing Club Nintendo to secure one of these coins. Be sure to let us know in the comment section below if you've been lucky enough to bag one. Yep, managed to grab mine. Used Google Chrome and took a lot of patience but I was victorious! "We believe some are having some trouble accessing Club Nintendo"
No surprise there. The UK/EU Club Nintendo is the most painfully slow, buggy, badly optimised web application I've ever come across. Often takes minutes for pages to load, and when entering codes often takes over half an hour to allow you to enter a new one (it thinks you're still registering the previous game for that long or more after you're actually done). I love Club Nintendo, but their site is just embarrassing. If this was in the uS store, I'd so get it. Nothing is really worth spending the coins on right now. I got mine pretty quickly. It froze after I got mine. I have the Mario 25th one too so it'll go nice with it. And yet our European brethren still believe that their Club Nintendo is inferior to the NA counterpart. Sorry, but I'd rather have cool physical items than a handful of worthwhile digital downloads that might pop up a few times a year. Got through after a bunch of refreshes. Was fine once in checkout Can't wait! @solcross The reason we say it's inferior is because this item is the only thing people might actually want and it will cost them more than a generation's worth of first party games just to get it. You literally can't compare the two shops when NA get games for buying 3 retail games. This requires you to buy 10-15 full priced games to get a small coin and other gifts include 25 games worth of points for a 7cm stuffed cube or CD.. I got on fine and decided if I am going to cash in a lifetime's worth of points, I might as well wait til they make a decent Wii U peripheral or something useful. @solcross Are we even viewing the same stuff here? lol, it's cheap rubbish. I'd glady take games instead. @Morph - maybe, I am pretty sure that not every game gives you 250 but I might be wrong. I have never cashed mine in and have bought over 30 first party title titles at retail and I have 3750 points. You guys in Europe are getting some sweet swag lately. @dartmonkey The Mario one was only 750 stars too. I've been looking for the Luigi one on eBay all year and so it's good to see it released over here. @Nintenjoe64 are you sure your stars havent' expired? Ive got 12,000 stars left now and in recent times ive got the game storage case, yoshi cleaning cloth, the snes pad and now the luigi coin. Plus i got the free layton storage box and the free project rainfall coin set not bad for freebies really. I want this on Club Nintendo Australia! Finally got mine, I purchased 2! @Morph I've just realised I spent loads on Wii points..... Oops! Either way, our gifts are terrible most of the time. I will save my points up to get a nice peripheral or boxed exclusive game. I might be waiting a long time. EDIT: Ordered 2 more, first time something is up there that might be worth something! Just 1500 stars? TOTALLY ordered one. I could order another too, but these will probably go so fast that wouldn't be fair. Just ordered one with the 18 game cards case! They were giving those away at the Best Buy E3 thing in America. They're awesome. NORTH AMERICA WANTS SOME LOVE FOR ONCE NINTENDO! Got it. Thanks for the tip, Nintendo Life! they kind of get all the digital games, They can buy Wii points cards and yet we only get 4 choices of games (most of the time they blow) so they have it even better than our game selection. you guys get keychains, screen cleaning cloths, a platinum reward from 2010 in North America, the special coin. Wii points card which gives you a much wider selection than that we get from our monthly 4 games to choose from (most of which are crap), pretty cool notebooks, a music CD of a game with some of the best music, Large DS game case (larger than ours and looks better), DS accessory case, Awesome wall foams (we get kirby patches for book bags but the foams you are are superior), DS game. So... what do we have that I would call better than yours? Posters...Tote Bag.....and possibly the Wii Remote holder even though the good one has been sold out for like a year..... So yeah, your Club Nintendo is FAR superior that what NA gets. That much is true. I am sitting on 1500 coins and I can get close to another 500 if I registered the rest of my games and did the surveys. The problem, NA has nothing worth it. Also, how do we get free games but buying 3 retail? If I do, where are my games? I would really like my free games. Comparing is silly, both stores have their ups and downs. But I do know from following both for years....NA does get some nifty items AND has those special yearly rewards. Besides I don't call saving 4000 points for 10 euro's worth of Wii points, a good deal. Nintendo should pimp BOTH stores to Japan's level of awesomeness. I just got one. I have no doubts that it'll probably look a bit crap when I receive it, but I decided now was as good a time as any to actually spend some of these points I've been saving up. I'm still interested in getting the statue that's in the catalogue, but you can buy it on eBay for about £20. Dang it, I just used up 7000 of my points on the mario statue. A load of my points expired but I have a lot of games to register so shall get this. I saw this, signed into my account and I had 1450 star coins, went hunting round my house, checked my 3DS games, no had used them, checked all my Wii games, Nope!!! Then remembered I bought Brain Training on DS for two pound at a car boot, took my points to 1700!! And the 4 week wait begins. Just ordered mine using the internet browser on my Wii U, about time we had something worth spending my 7950 stars on. NA have a much better system to be honest with free games. As most have said let the 4 week wait begin. @Nintenjoe64 The only thing I ever wanted from there was the SNES Classic Controller. (£70 more than likely get one from Japan after import duty). The rest is just absolute junk. Ordered! I was planning on using stars to play Wii VC games, Super Empire Strikes Back and Super Return of the Jedi, but oh well, another time. Off topic: I don't understand why Nintnedo haven't made stars usable on the 3DS and Wii U eShops yet. I emailed them, and they just said you can use them on the Wii shop, which I already know and doesn't answer the question. Sometimes I wonder about Nintendo! @solcross These are not cool physical items. They are junk. The only worthwhile item was the SNES Classic Controller. (Maybe the Gold Wii Wheel). Anything I wouldn't buy otherwise I don't want. (All my 3DS/DS games I am playing are in the gamecard case the rest are in the loft). Emptiness is better looking than clutter. (And it is easier to clean). Cant decide whether to get this or the game case. @unrandomsam Well if you're going to be absolutely pragmatic about it, everything related to this hobby is junk. @solcross Games / Hardware / Peripherals are kind of needed. Thanks, just ordered. Need to get my points used up! WTF!? Why would they only offer it in Europe? @solcross Its not the same though. It is not required to have the hobby but to have it requires games / systems / peripherals. Having this coin is just another thing to have lying around. @unrandomsam And games/systems/peripherals are also things to have that lie around. Got a very similar coin on the Nintendo E3 Best Buy tour. @solcross True I think the difference is I see stuff like this as part of the problem and stuff like the club nintendo game card case as part of the solution. @solcross #27 How convenient for you to not mention actual classics like Zelda. @Doma Sure, that's great when the classics are actually offered. @solcross you guys get coins off virtual console titles as well as platinum rewards so stop complaining. The NA Club Nintendo rewards are pathetic right now. Hopefully we get this. It has deleted, or I can't find it now? yeah so it seems now everyone else is getting some interesting items but nothing for NA? In other news, the Year of Luigi has been postponed to Q3 2014. Seriously, how can they release a coin to comemorate something that turned out to be just hot air from your marketing departmetn? They could call this "the year of metroid" just as easily and you'd be none the wiser. Or what makes it the year of Luigi? I can hardly supress my sarcasm every time I see that banner in the eShop. The year of what? Well looks like I was lucky to get the coin when I did. I may even pick up the game case aswell. @Jazzer94 I believe you've been severely misinformed about Platinum rewards. @SilentHunter382 The game case is massively better quality than e.g the Hori supposedly officially licensed ones. (Surprised me but it is really well made). I really want this but I am 50 points short! Went ahead and got the game case also. Thanks for you info on it. @Sceptic New Super Luigi U released. Lugi-focused Mario & Luigi game released. Luigi based 3DS XL released. (Still no Mario ones). Some Nintendo events were Luigi focused. Luigi's Mansion 3DS XL set to be released. The Year of Luigi Sound Selection released in Japan. Year of Luigi stationary released for NLB/Swapnote, as well as 2 letters sent about the celebration by Nintendo staff. Clearly, there's been nothing going on. @C-Olimar: Glad we agree. Three games on two platforms and lots of bla bla. That's really not even close to what I imagined when they announced it. Marketing fireworks, specials, sales, bundles, "everybody needs one" releases. Something like that. But what you desciribe is just business as usual. Or do you think those three games would not have been released if it had not been "the year of Luigi"? Get real man. I've seen Skylanders stationery. Is it "The year of Skylanders" too? Let's play a game: It's "the year of Metroid" and I said "that's nonsense" and you make me a list to prove me wrong! Let me warn you though, you may be shocked by the similar results. @Sceptic New Super Luigi U wouldn't have been released. There's the one game. Do you seriously think it's business as usual? Luigi based 3DS XL released - this would not be out if Nintendo weren't celebrating Luigi this year. Especially before a MArio themed console. Commemorative coin released. - Wouldn't have happened. Some Nintendo events were Luigi focused. - Speaks for itself, really. ................Didn't Reggie or someone once mention it in an interview? It was probably talking about how Retro decided not to make a Metroid game though. Please, enlighten me, in what way is the Metroid series comparable to Luigi in terms of promotion this year? This is not listed so I guess I´m late and they are all gone. If they are going to reward for my Nintendo purchases at least they could give away something nice. I will need 500 more stars (100€ more) to get guess what: "NES notebook"
So spend 600€ on Games and your reward is a lame notebook worth 5€ at the most. The nice game and watch ball reward is worth 7500 Stars (more than a 1000€ in purchases to get) and we dont even get any stars for VC games which are very expensive too.